roads | There once was a creek . . .
There’s nothing like a change in surroundings to cast your normal environment — that familiar place you call ‘home’ — in a new light. The closer you are to something, the easier it is to forget what makes it special or distinctive. For me, home has always been Brisbane’s western suburbs. I’ve lived in Bardon, The Gap, Toowong and, most recently, Roaslie (which nowadays is just a part of Paddington). But a few months ago I ventured outside my native habitat, moving across the river to the southside, landing in a sort of semi-rural-industrial outpost called Rocklea. Like Rosalie, Rocklea is built on a floodplain, and to that extent probably should never have been built at all. But that’s about where the similarities end. It’s not just that you won’t see any cows or two-train semi-trailors in Rosalie, or that the local cuisine there gets more exotic than meat pies.1 For me, the most striking difference between my new environment and my old one is the topography. I’m used to living among hills. In Brisbane’s western suburbs — in Paddington, Bardon, Ashgrove and Toowong, for example — there are ridges that you can follow all the way up to Mount Coot-tha. In those parts of town, you live either on a hill or at the bottom of one. Not so in Rocklea. If I look to the west from here, the first big hill I can see is the southern tip of the D’Aguilar Range. To the north-west it is Mount Coot-tha and the Taylor Range. The CBD lies nearly 8km to the north, but from here you can generally get city views by climbing a tree.2 To the east it’s easy riding until you hit Toohey Mountain and then Mount Gravatt. To the south, on a clear day you can see just about forever, and leading you most of the way there is the great floodplain of Oxley Creek. This is the second in a series of posts about Langsville Creek, which was Western Creek’s upstream neighbour on the Toowong/Milton Reach. You may want to check out Part 1 and Part 3 of the series. 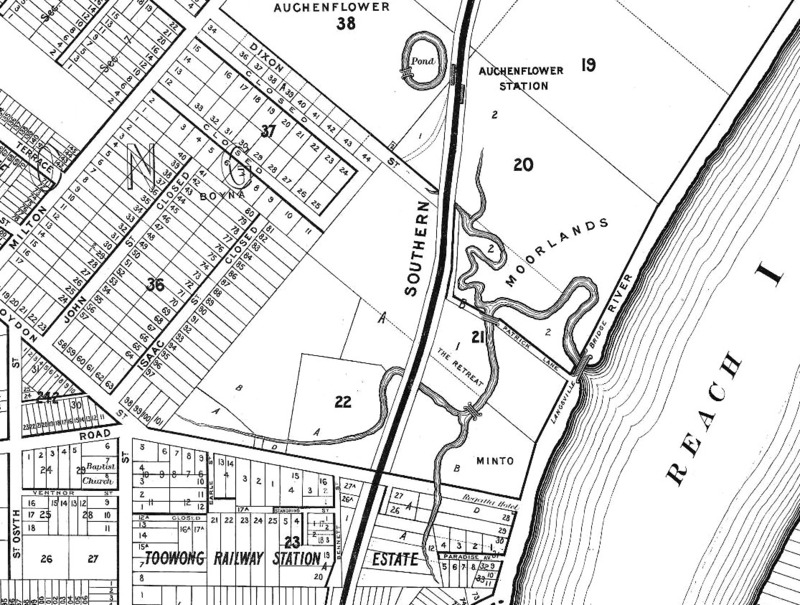 If you look at the Milton Reach of the river on any of the old maps of Brisbane, such as the one drawn by A.R. 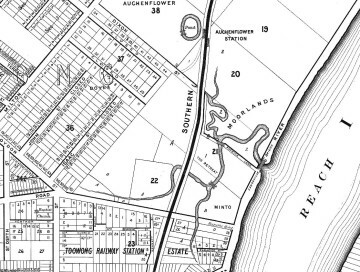 McKellar in 1895 (shown to the right), you will notice a creek with several winding branches that meets the river at Patrick’s Lane. This was known as Langsville Creek. 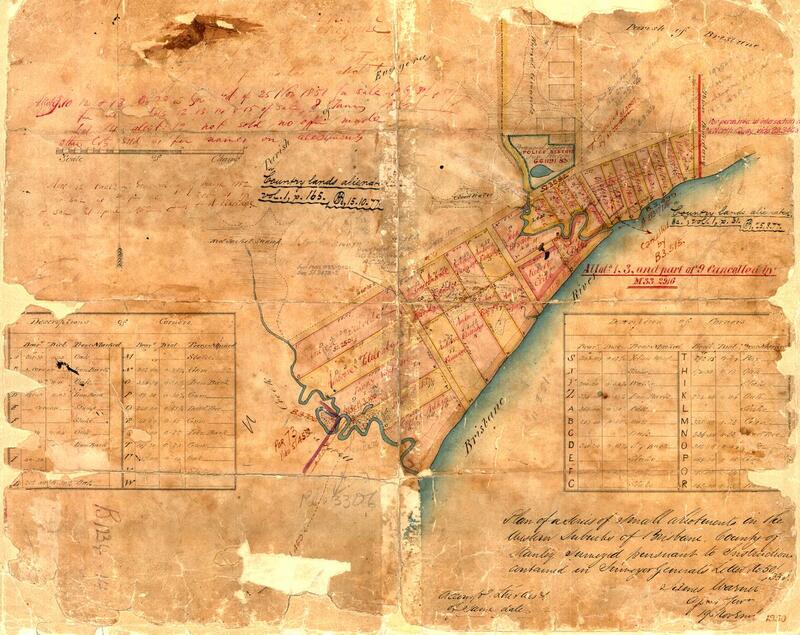 As we saw in Part 1 of Uncovering Langsville Creek, the creek as it was depicted on the old maps is now gone. A few drain openings are about the only physical reminders left of what must have once been a prominent part of the landscape. But there must have been more to Langsville Creek than just the meandering branches shown on the early maps. Each of these branches must have had an origin somewhere further upstream. 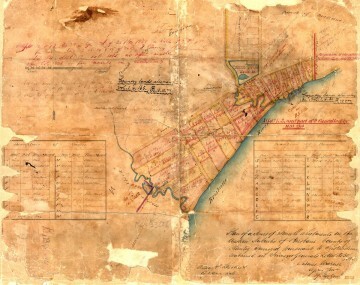 With one or two exceptions, the early maps show nothing of those upstream parts of the creek. Our understanding of Langsville Creek will remain very superficial, however, if we do not look further than what we can see on the maps. It would be like trying to understand an iceberg while ignoring everything under the water. If we want to uncover Langsville Creek and its legacy in today’s landscape, we need to look further upstream: we need to see the whole iceberg.